I have wanted to write a testimonial about the high quality of Diamond P Labs for some time. Please feel free to use any part of the following per your discretion. Andy Moreland. Hope against hope this is still a valid email address for you. Want to tell you AGAIN how very much we love our Boomer Hunt (beauty shot attached!). He is the BEST dog, the smartest, most well-behaved, pleasant, people-friendly dog we have ever known. We love him so much it scares us. We have bragged about him to friends, acquaintances and strangers (usually with him within hearing distance ... but he remains humble! ), talked about him to the point where numerous people have told us that THEY too have had a lab they loved beyond all other dogs, one that was captured their hearts and souls, was handsome/beautiful, well-behaved, smart ... in short, THE BEST DOG THEY HAVE EVER OWNED. And a good majority of those people have advised that they got their dog(s) from YOU! It is always a pleasant and wonderful, heartwarming surprise (but somehow not a surprise at all). You, by doing exactly what you do, have made so many people happy, have made so many families complete. For this, and for our Boomer, we thank you from the bottom of our hearts! Our best to you and Ron (I hope I'm recalling his name correctly but apologize if I'm wrong), the man whom I DO distinctly remember saying (as I was crying because Chris Hunt was trying to pick a different dog than the very sweet puppy sitting at my feet, smiling up at me for a second time and trusting me to pick him) ... "Are you CRAZY??? If you have THAT kind of a reaction to a dog, THAT's the dog you're supposed to have!" I knew then, we all know now. By the way, is he not BEAUTIFUL!?!?!? I feel so blessed that I found Diamond P Labradors the care and support they give you before, while waiting, and even after you get your little one home is phenomenal. I loved the fact that Patti sat down with me and discussed what I wanted out of my female Labrador. She has done her research on her dogs and knows how to choose the right parents to produce the puppy you want. Patti was so supportive when I was waiting for my Abby. The first litter was all males so I was placed on another litter’s list. This one produced Abby. I was able to call and check on the puppies’ statuses. I made several visits each time getting to interact with puppies. Abby is a typical happy-go-lucky Labrador with the most gentle and loving spirit. I am so thankful I picked Abby from Diamond P Labradors, Patti knows her Labradors and cares about where her puppies go while supporting us the owners. I would recommend a puppy from Patti any day. Diamond P/ Patti Jo Scott in regards to Delta our female out of Turbo & Junebug... She has been a jewel from crate training, field and duck hunting, to being member of our home. She has turned out to be quiet an athlete, yet mellow and trainable. Looking forward to her completing her senior field competition, then its ducks ducks ducks! "Since the mid-1990's, Diamond P Labradors has provided me with high-quality, beloved Labs that have enhanced my life immeasurably. Whether hunting in the field and lakes, or playing at home, Diamond P Labs are sweet, serious, hard working, loving, and beautiful. I am indebted to Patti Jo for breeding such special dogs. I can't imagine owning any Lab other than a "Diamond P" Lab." Amber and I send huge hugs! We have been doing business with Diamond P Labradors for over 15 years now and have taken four dogs during those years from Patti Jo Scott’s kennel. We have also recommended her to friends and associates as a great place to get your Labrador retriever. Diamond P has a great line of hunting dogs as well as all around great family pets. The kennels are clean and well maintained and every effort is made to keep them free of germs brought in by us mere humans. 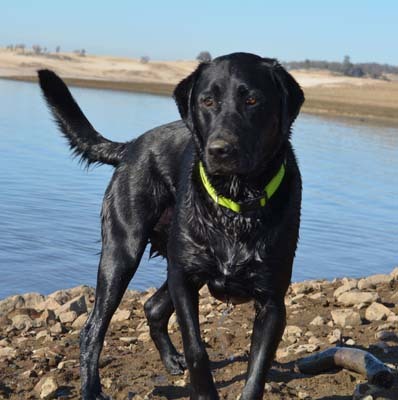 We got our last male puppy in February 2011 and he is an outstanding hunting dog at just one year old and of course has that great Labrador personality. Patti crate trained Carson for us and sent us home with instructions for “potty” training and a folder with answers to every conceivable question that could possibly arise with a new puppy, Patti has always been available to answer questions and offer advise. Diamond P is a great place to get your new best friend!